What is MikuTelopE effect? How can I make subtitles for MMD? What is better, Nameplate or MikuTelopE? Until lately, Nameplate MME effect was the only method to add text messages to your MMD pictures or videos. Alas, with all its advantages, it also makes subtitles creation rather painstaking, especially when you need more than one phrase to appear. You have to prepare each subtitle as a separate .png file in the image editor, then adjust its position on the screen using Dummy Bone… and then you decide to move your camera and desperately try to figure where your title disappeared to. Here’s an alternate method to add text to MMD. MikuMikuTelop, originally written by SoboroP and then translated into English by harryhack91 as MikuTelopE (along with fixing the bug that prevented its usage on computers with non-Japanese locale) is not an MME effect as such but a *tool* to generate ones. Using it, you can apply any volume of text messages to your MMD video in a breeze. 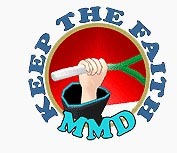 Download the archive from the link provided on a dA page mentioned above and unpack it somewhere in your MMD folder. Launch the MikuTelopE.exe, hit “Load” and select one of .txt files in the “samples” folder (your actual files don’t have to be resided there, so apply whatever policy you use to organize your files, as long as you can find your works afterwards :) ). Immediately you will see that a subfolder named “your_file_name_MMT” is created next to it. Load your MikuMikuDance project, open “PostTelop.x” (at this moment the screen will turn red; keep calm and carry on) and then “MikuMikuTelop.x” from that subfolder into the Accessory Manipulation Panel, and you’re good to go. Hit “Play” and you will see your subtitles playing on top of a video you made. That’s it, there’s nothing else you need to do to make subtitles! …Provided you have the file, of course. A script to produce subtitles with MikuTelopE is a simple text file you can write in Notepad. It consists of three types of lines: format and positioning description commands (preceded by “:”), timing commands (preceded by “@”), and actual text (everything else). If you’re not used to doing things through scripting, it may feel complex at first, but in reality it’s not that difficult. Let’s see how it works. Depending on aligning (see below), lines of text are attached by the middle, edge, or a corner to the “anchor” – position described by “pos” commands. By using “pos_next/line” commands, you can put two or more lines adjacent to each other without calculating their exact location for all but first one. It’s not very convenient, though, as those positions are calculated *really* close to each other, without slightest gap between texts and with no regards to such additional effects as fonts’ border, margin, or shadow (hint: for horizontally adjoining lines you can use leading whitespaces to create a necessary gap). While the readme does not recommend using multi-line titles, short sequences seem to be processed correctly. The first command places an anchor in the center of the screen. Then, two different sets of position instructions are used to display their own descriptions. As you can see, rather than placing a title to the top, bottom, right, or left from the anchor, it sticks its top, bottom, right, or left edge to the anchor, respectively. If this looks non-intuitive, well, that’s Japanese for you. You do not place more formatting commands between timing commands and actual text. Now, knowing basics of MikuTelopE scripting, let’s try something real. Copy the example above into a text file, load it into MikuTelopE, and load resulting effects into MMD. What do we see? First, the second subtitle appears before the first one disappears. Second, both lines are seen on the left side of the screen. Since we didn’t specify titles’ duration, it’s calculated using the autotime parameter, which is set to 0.3 seconds by default, or 9 frames per character. As for the second… perhaps the default for horizontal alignment is left? Let’s edit the file and see what happens. Well, that should be enough to allow you to study MikuTelopE’s possibilities further for yourself. Q&A: Does it mean Nameplate is obsolete? No, of course not. There are qualities that make Nameplate an instrument of choice for certain purposes. MikuTelopE only works with texts. Sure there are many sophisticated fonts, including those that allow to use pseudographic, like Wingdings, Webdings, etc, but in the end of the day MikuTelopE is solely a text engine, while Nameplate lets you display anything you can draw, limited only by the size of your .png file. While positioning of Nameplate requires more effort (especially if you use moving camera), it is also more flexible. Images placed on the screen can be moved (moving a respective Dummy Bone) and resized (by effect’s “Si” setting). So far, the current version of MikuTelopE has no such functionality. I load the file, but get a “couldn’t find .\template” error! This happened to me when I tried to use MikuTelopE on an XP machine. Fortunately, the error is not fatal. First, hit “Refresh” – the script will compile properly this time. Then find “MikuTelopE\template” subfolder and manually copy files “MikuMikuTelop.x”, “PostTelop.fx”, and “PostTelop.x” from there to the folder containing your script. After that, it will work normally. Models used for the head picture: Kaito wears male suit by MMDFakeWings18 and Bowler Hat by Rainb0wCat & Crazy eyes. Rin Kagamine wears Loli dress by Saler1. Okay, it wasn’t too long for me to have another problem. Same old, same old…” is, I’m getting errors even if I change 2.2 to 2. What’s more, I’ve tried a lot of numbers combinations and it just doesn’t work. Neither @3-2, @2-3 nor anything else. I’m also not too sure about what does minus in @x-y stand for. Also, what do “get” and “set” do? Hmm, weird, I remember getting a meaningful response with it when I wrote the tutorial, but now it doesn’t work, just as you say. The good news is, you can get the same result using “@3,2″… and even with fractional numbers for *both* parameters. This form is used for parameters “start-time” and “duration” instead of “start-time” and “stop-time” like x~y does. :SET memorizes the cumulative state of format in a variable. After that you may quickly restore it with :GET instead of reissuing all commands again. Do you go to the MikuTelopE window and erase all error message popups it throws when you hear the sound? Ah, so that’s what it does. I think I understand, so :SET takes into consideration everything that is written above, concerning the lines’ format? Yes, I do close error messages, then I try to save .txt again. Sometimes I need to try and save it once, get an error, and finally the second time to get an OK, but when that proves futile, I have to restart MikuTelopE. It doesn’t happen every time though, like I just intentionally made a syntax mistake, got the error, then edited to the right version and get OK back. It isn’t much of an issue to use, but the bug persists. Same old, same old…” phrase. Now I change back to 2.2, save – and get an error. I save once again, the error keeps occuring no matter how many times I repeat the action. But then I change back to 2 – then I get an OK again. I just tried to change it to 2.1 now, saved once – error, twice – error. The third time I saved, it surprisingly gave me an OK. Then changed back to 2, kept getting errors all the time, but changed back to 2.1, had to save 3 times again to get OK. Changed to 24, got error first and second time saving, but third time was ok. Changed to 25, had to save TWICE this time. Changed to 26 and kept getting errorrs all the time. It’s so random! tl;dr version: errors seem to happen randomly. Don’t you get errors like me? Hmm, no, to me it worked consistent enough. Weirdness. Do you get the same error if you put “:autotime 1” or other integer number? Open Control Panel’s Region and Language section and see what is your value for decimal symbol (must be dot) and digital grouping symbol (must be comma). See the picture for details. Damn, I hope I won’t forget about that option the next time I’ll need to change it back! For now the problem has been solved, thank you for quick response! If I won’t know anything else, I’ll ask again! By the way the guide was nicely explained.